Tranquility in a parklike setting, this territorial hacienda is located in the 'mesquite basque' area of the Tanque Verde Valley off of Tanque Verde Loop Rd between Tanque Verde and Speedway. Easy drive to downtown Tucson, central Tucson, Tucson International Airport, Tucson Convention Center, fair grounds, University of Arizona, access to freeway (I-19 and I-10), Mt. Lemmon Hwy and many recreational and special interest areas. Located on a quiet street with a private gated entry, this home, over 5,000 sq ft of living space, is nestled on 3.3 fenced acres, amidst lush vegetation, on the Tanque Verde Wash. This spacious,beautifully decorated home, has a heated pool complete with jacuzzi and water features, a 600 sq. foot Arizona Room, 4 bedrooms, 3 full bathrooms including a spacious master bedroom suite, gourmet kitchen and a second complete kitchen, laundry room, very open, flowing floor plan with comfortable living space, 3 TVs, DVD, internet, stereo speakers inside and outside, outdoor gas and charcoal BBQ grills and indoor and outdoor fireplaces, three car garage. The property boasts several ponds housing Koi fish and water plants and has stables, home to 3 miniature donkeys. Horse facilities available include covered stall and pipe corral, automatic water system, cross ties and large tackroom with electricity and sink, turn out area and room for trailer or RV. Many trails in area for riding and walking. Great location for those who desire the activity of events and sports, but want peaceful respite yet easy travel to events such as the Tucson Gem and Mineral Show, Tucson Rodeo and international golf and cycling events. Perfect for those who want to 'get away from it all', watch the stars at night or view wildlife from their own backyard. Maybe read a book while in a hammock and just get away from it all! Large covered porches with fans, courtyards and patios surround the home providing a unique setting for every room through their picture windows and glass doors. Saltillo tile floors and granite counter tops throughout and furnished to complement the ambiance of the spacious home, relaxation in comfort is enhanced by beautiful design. This property does not permit events, such as weddings. Truly a private ranch in paradise! We had a great stay at Rancho Privado. Beautiful, well-equipped house and grounds and plenty of room for 8 guys on a golfing week. We loved relaxing in the hot tub after a hard day and walking around the neighborhood in the morning to prepare for the next round. Beds were great and even the two guys who drew the couch and futon got along well. Lisa and Ray were great hosts. If Tucson is our destination for golf next year, Rancho Privado will be our first pick for headquarters! Wonderful. There were 12 of us and we each enjoyed the many sitting areas. Played cards at the large dining table and cooked breakfast in the large kitchen. Was a wonderful stay! All ten of our family celebrated Christmas at Rancho Privado and we couldn’t have been more pleased! Owners Lisa and Ray provided everything we needed for the occasion, as well as responding to any requests we made. This spacious, beautiful property is near Saguaro National Park East, Sabino Canyon, Agua Caliente Park, and shopping, especially for groceries. This is truly an amazing property! Rancho Privado was truly private! , shops etc...Charming Tucson design and decor. Pet friendly and comfortable. We only rented this property because we needed enough space for our large family (12). We had no idea how wonderful and serene it would be! I have never slept so well on vacation. Sure the place was spotless and completely stocked but what the pictures can't show you is all the extras! So many little discoveries both inside and out. We were there for our daughter's UofA graduation. We had a luncheon on Saturday with several of her friends and their families. They didn't want to leave! The miniature donkeys were so gentle and sweet. There are so many patios with comfortable furniture to enjoy the wildlife. My only regret renting this property is we didn't stay longer. 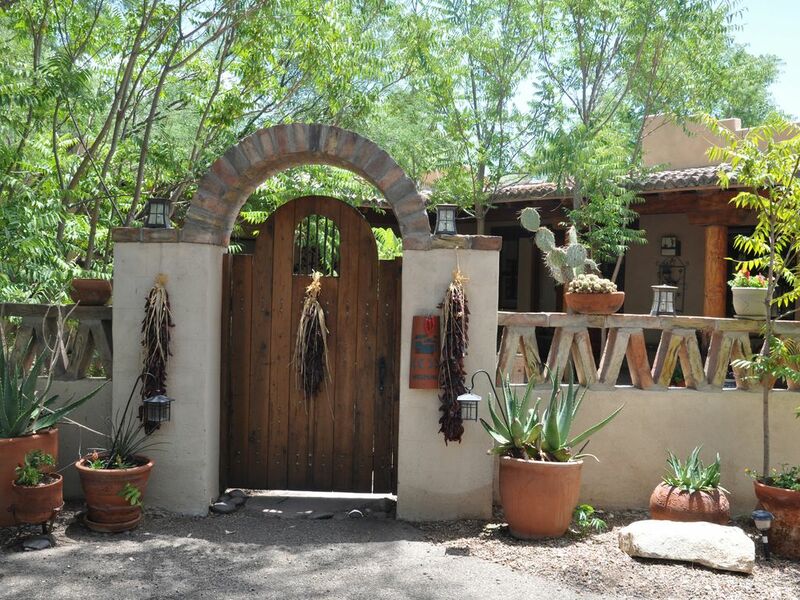 Rancho Privado is a quintessential representation of Tucson and the Southwest! This was a perfect location for us to hold a reunion with our adult children. There were 9 of us, plus a young baby. It's a large property and "double" house, giving lots of room to spread out. We should've eaten more meals there because the number of seating areas is almost unbelievable! The pool area made for a cozy place to chat. The hosts are responsive and accommodating, so don't hesitate to book this property.